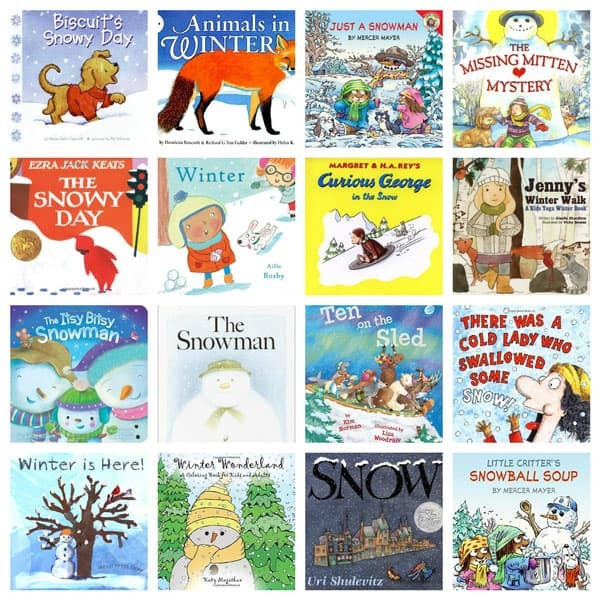 Winter is here and it’s time to change the seasonal books in our book basket for the toddlers and preschoolers to read and us to read out loud to them. We’ve been sharing our books for toddlers and preschoolers here on Rainy Day Mum for you to pick from and read together with your little ones. 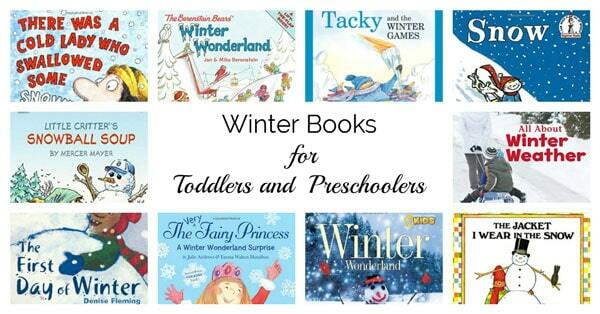 So we’ve put together our favourite Winter Books for Toddlers and Preschoolers. 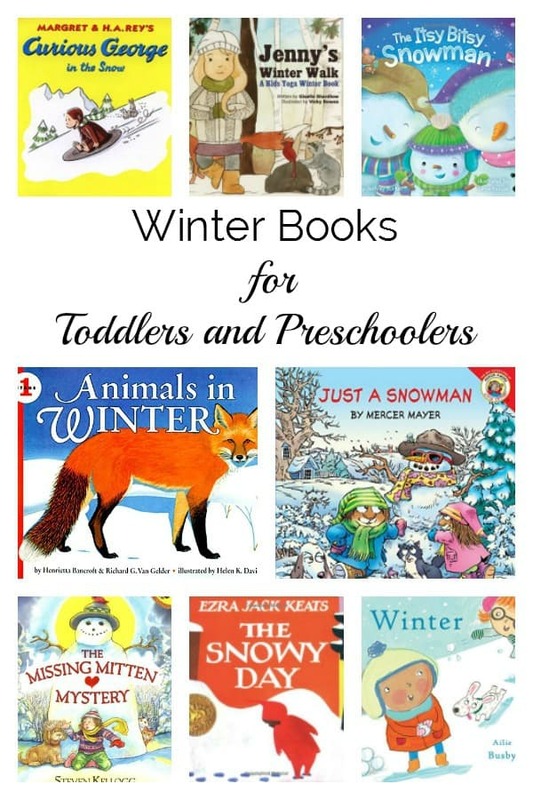 If you are looking for activities that would work well in together with these books then check out our Snow and Ice Activities for Toddlers and Preschoolers for some fun ideas. We have included links to the books on Amazon via the images and blue underlined links below. First off is Winter by Gerda Muller, this is a picture book which is great for getting children to talk about the story and use the language of storytelling. 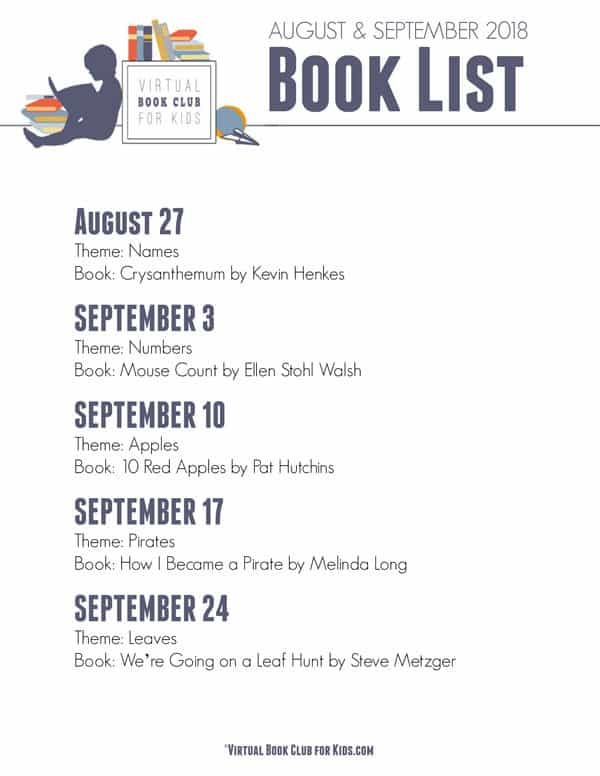 I would recommend all 4 of these season books to add to your bookshelf as even with my children in 3rd grade we still use them as prompts for creative writing. Connecting favourite characters with reading is a great way to get kids to read and want to read especially those reluctant readers Curious George is such a fun character and Curious George in the Snow is typical with George getting into some trouble whilst out with the man in the yellow hat at the winter games. In this child-centred book Winter Seasons (one of 4) the season is explored inside and outside through the senses and play. This is another book ideal for toddlers and young preschoolers like the next one on our list. One of our favourite Nursery Rhymes is Itsy Bitsy Spider and The Itsy Bitsy Snowman is a fun Winter version of the rhyme. Ideal for babies and very young toddlers this book is fun to read together. One Winter’s Day is the story of a kind and generous little hedgehog (the same from One Snow day) who gives away his clothes when woken up by the wind during the winter as his nest is blown away. With different versions having touch and feel or a CD of the story this is a fantastic book to add to your bookshelf this winter. Once you have read the book why not make some Hedgehog Bread Rolls with the kids to eat at the same time. Although the winter Olympics are every 4 years we are big fans of winter sports in our house and Tacky and the Winter Games is such a fun book to read together. You read how his friends and he prepare to compete in the winter games and keep your fingers crossed that he’s not naughty at all! No Winter book list is completed without The Snowy Day by Ezra Jack Keats featured in our Weekly Virtual Book Club for Kids in January 2018 we have had fun creating Peg Dolls and Investigating why you use salt on roads. The Bear’s Winter House tells the story of a bear who makes e a house that during the summer and autumn everyone thinks is silly until one winter’s day when the wind and snow blow their nice homes to bits and they move in. In this sweet book, Biscuit’s Snowy Day follow Biscuit a little dog as he explores the powdery snow and has fun doing all of the fun winter activities. Snow Days were a highlight of my time at school – an unexpected day off school and they started back when I was in preschool. In Little Critter: Just a Snowman, Little Critter has a snow day and has great expectations on what he would like to do on this wonderful day but everyone else in his family has a very different idea – sounds familiar right? One snowflake will never come to anything – it won’t settle and will melt quickly they say. But the boy in Snow Sunburst Books doesn’t believe that. Read and watch as the city in the book is transformed as that one snowflake turns into flurries. A long time ago I had a scary book about Jack Frost and the pictures in it as well as tale made him quite a frightening character. It was something that I didn’t want my kids to think about but hunting around I discovered Here Comes Jack Frost with beautiful Illustrations and a fun story it is a great read for the children. The first book that I brought my son when we discovered we were pregnant was The Snowman by Raymond Briggs closely followed by the DVD for my daughter when we found out we were pregnant with her! It’s one of my favourite stories and I love the beautiful illustrations throughout the book. A favourite series in preschoolers around the world this winter version There Was a Cold Lady Who Swallowed Some Snow! lets you discover some of the items associated with winter and one very special activity that happens at this time of year. Discover the secret to building the perfect snowman in The First Day of Winter as you follow the children through the first 10 days of winter. With rhymes and repetition, this is a great book for toddlers to enjoy. Winter isn’t all boring read this beautifully illustrated book one of 4 in the series of seasons about what there is to do in Winter from sledging to exploring nature at rest and of course baking cookies. Winter is Here! and the other 3 books in the series make great additions to your children’s book collections. Are your children like mine then they are forever losing their mittens then The Missing Mitten Mystery is the book for you. Annie loses her mitten and searches through the story to find her missing mitten. This would be an ideal book to give as a gift for a winter birthday with a pair of mittens of course. The Mitten by Jan Brett is a seasonal favourite of ours – with beautiful illustrations typical of her stories we’ve had so much fun creating activities to go with this book. In this classic from the Berenstain Bears Series The Berenstain Bears Winter Wonderland the land is covered by snow follow the bear cubs as they ski, sledge, ice skate and have all of the fun of winter. When siblings decide it’s Lemonade stand time the fact that its winter won’t let them be put off Lemonade in Winter: A Book About Two Kids Counting Money is a wonderful story about siblings and persistence as well as having some fun with counting too. If your kids like There was 10 on the bed then they are going to love Ten on the Sled using the same tune these winter animals from polar lands take a sledge ride. Ideal for counting, rhyming and singing this is fun for preschoolers to join in with. Jenny’s Winter Walk: A Kids Yoga Winter Book written by fellow Blogger Giselle Shardlow of Kids Yoga Stories has produced this fantastic book that you follow along with Jenny as she takes a winter walk and as you go you act out the different winter themes with yoga poses. A fun way to keep active indoors when it’s too cold to go outside. 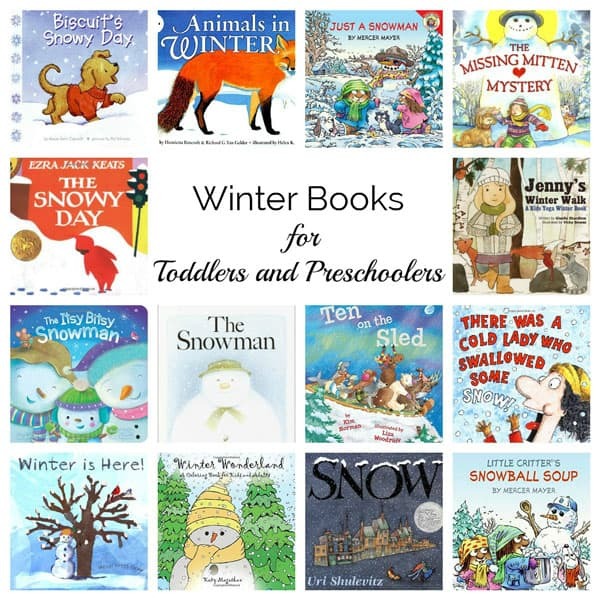 I love introducing children early on to non-fiction books and if you have read any of our books lists before you will see that where possible I try and include a National Geographic Kids book and this list is no different Winter Wonderland National Geographic Kids. Although covering Christmas as well this would be a great addition to your bookshelf. Find out about what different animals do during the winter in this non-fiction book All About Animals in Winter Celebrate Winter, which animals fur changes colour and why, which hibernate and what do the other animals do. How is snow formed – what do the crystal look like. 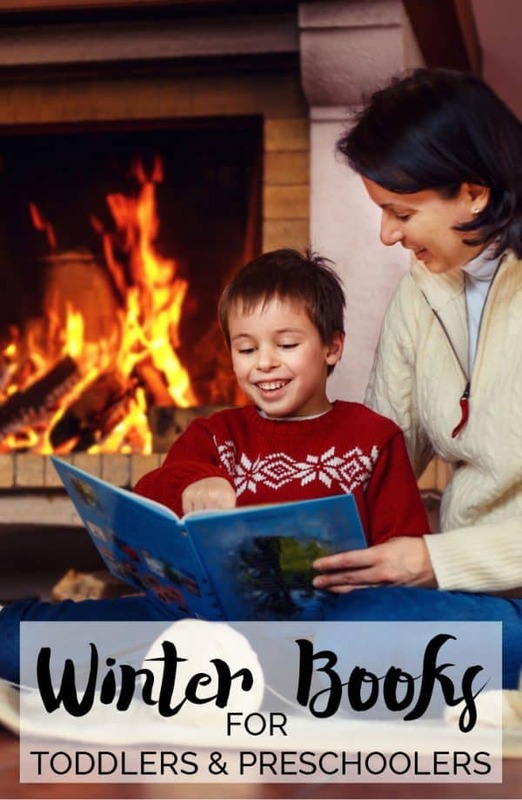 Help your children to answer some of these questions with The Story of Snow: The Science of Winters Wonder and ideal book if you have a “Why” child. With real pictures of snowflakes and instructions on how to catch them, it’s a great non-fiction book to add to your winter reading list. In this non-fiction picture book, All About Winter Weather Celebrate Winter discover the weather and enjoy reading with your older preschoolers. This is an ideal non-fiction book for those emergent readers and those getting to grips with reading. The Let’s Read and Find out series of books is a great set of preschoolers and they will go through to Kindergarten when children can start to read themselves. Animals in Winter Lets-Read-and-Find-Out Science goes through what happens to many different species of animals during the winter months – like where do the butterflies go? Those look like wonderful books. I’m especially interested in the “The Winter Hedgehog” My little boy loves hedgehogs.